About Toolkit Websites, Web Design Company UK. Since humble beginnings nearly 20 years ago, we're now a thriving and successful web design company. 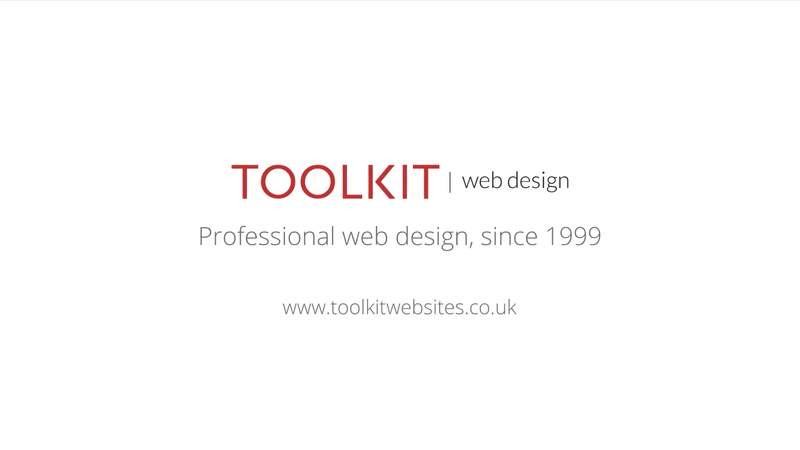 Toolkit Websites is a specialist web design company in Hampshire. We have nearly two decades of experience in successful website design for small businesses and now boast a client base of over 2,000 happy customers all over the UK! We are one of the few website design companies with the trusted ' Buy With Confidence ' award from Trading Standards and we pride ourselves on our excellent customer care. We have countless 5-Star ratings for our commitment to passionate customer service and put simply; we love what we do! We provide bespoke web design services and create all our websites from scratch. This ensures they are fast and tailored to individual needs to guarantee the perfect result. Our Content Management System, the Toolkit , is our biggest selling point and makes updating websites easy and fun. Our clients can update their own company websites any time they like! Friendly, unlimited customer support is provided at all times and we're only 3 rings away if you need us. We aim to build long-term relationships with all our customers and we hope that you'll join us! We believe in great quality web design, passionate customer service and a happy team! Our friendly Support team of website design experts in Southampton and Havant, Hampshire are always on hand to answer any questions you might have. Whether it be about updating your website, marketing or SEO, we're here to help. We are committed to providing you and your company with a fast, friendly and efficient service at all times. This means maintaining a high-level of customer care - remember, we're only 3 rings away! Fast telephone support Calls are answered by real people and there's no need to press 1 for this or 2 for that. We use a local-rate numbers and our expert Support team is based in our offices in Havant where they're always happy to help. We aim to answer every call within three rings . Fast email replies We reply to customer emails quickly and efficiently. Our experienced Support team will either help you directly with as much info as needed, or find the right person to solve your query. We aim to answer every email within an hour . Unlimited design changes We created the concept of unlimited design changes during the build, which is often difficult to find elsewhere. We believe in creating your company website design the way you want it, without restrictions. This guarantees 100% satisfaction before going live. Friendly support & training We developed the Toolkit to be easy for all to use but we recognise that many of our clients are new to the web and need an extra helping hand. That's why we offer unlimited Toolkit training and support to our clients, whenever they need it. Security & reliability We invest heavily in the future of our business and in the safety of our clients' websites. Our dedicated internal development team ensure our platform is fast, reliable and totally secure at all times. Everything is securely hosted on some of the world's best severs. Inbound transfer support We work with your existing Domain and Email providers when you first join us to ensure all of your existing services are moved over smoothly . We often go above and beyond, liaising directly on your behalf to ensure a smooth transition to Toolkit Websites. Marcus Green set up the business in 1999 whilst at Southampton University studying Computer Science. Within days of getting his first client, he quit his course and began working on the business full time. The business, under the name of Green Design, first started building websites specifically for the marine industry. Soon we had a number of high profile clients such as the Volvo Ocean Race, Ellen Macarthur and the Louis Vuitton Cup. With the bursting of the dot com bubble, and high profile sailing events being cut back, the business had a long hard look at how it wanted to position itself going forward. Marcus and the Team devised a five year plan to diversify the client base from solely marine based clients, to all sectors of service and manufacturing industries. This helped reduce the impact and influence any one client had on our company. The decision was taken to heavily invest in our proprietary content management system, The Toolkit, an online system that allows clients to update their websites. It was initially developed to allow the website editors of the sailing events to update their websites with the latest news 24 hours a day. It also meant we didn't have to get up in the middle of the night to update the website when Ellen Macarthur was in the middle of the Southern Ocean! The Toolkit has been adapted from the original brief to allow all our business customers to update all aspects of the website content. As well as having the control of the text and links, our clients can upload PDF's of their brochures, images and video. An ambitious expansion plan has been adopted to expand our client base from a handful of marine centric clients in and around Southampton to over 2000 clients based all over the UK and Northern Ireland. The business has expanded from a home office, to a successful business located in a prestigious office in Southampton's Carlton Crescent, before moving to larger offices at our new head office in Havant. The goal of our website design company is to be the market leader for small business websites. We typically build 5 to 20 page websites which are custom designed and built with our content management system that allows our clients to update their website 24/7 from any computer. Our constant focus on giving remarkable customer service is what separates us from other web design companies. Our chosen charity is the John Merricks Sailing Trust. John Merricks was a leading Olympic sailor and 1996 Olympic silver medallist. John died tragically in a car accident whilst competing in the 1997 Melges 24 European Championships in Italy. The John Merricks Sailing Trust has been set up by those closest to John to do some good in his name and further the memory of such a remarkable person. The purpose of the Trust is to help improve the physical and mental development of young people in-need (under 25 years old), through the sport of Sailing.